Father Jack had the most liked content! And Scott Shulton moves to St Albans Hertford Town have appointed Max Mitchell as one of two joint managers. Among his first signings is Chris Wild! Hmm... doesn't ring any bells. I remember Keith Searle scoring with a bicycle kick in a big win AT Dagenham around this time, but that's the best I can do at the moment. I'll have a dig around my archives tonight and see what I can come up with. 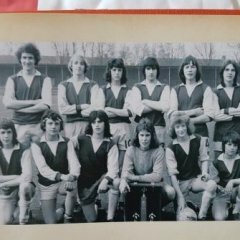 Enfield 4 Corinthian Casuals 1 in 1973. We were 4-0 up at half time. That's how to get a guy hooked! Wright, Hatton, Greene , Johnson, Weatherstone, Sutton, Parcell, Blackman, Bricknell, Youngs, Oliyide. Subs: Mubiayi, Ibe, Sayoud, Empson, Chaney Oh, and it's cold! Enjoyable 4-1 win over Burgess Hill last night. Good to see one of our youngsters Josh Davison grab an excellent hat trick as well. There was also a first team debut for Dan Heald, Greg's son. Anyone else care to join in?